Graduate students gather for the Hooding and Degree Conferral ceremony April 26. More photos in our Facebook gallery. 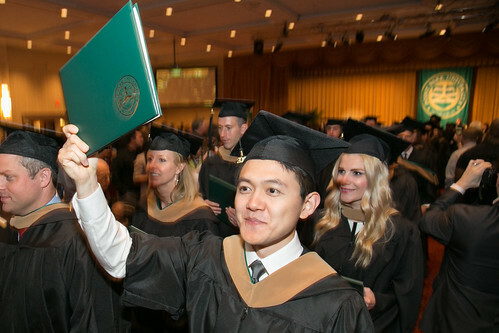 Point Park University conferred master's degrees on 175 students taking part in the annual Hooding and Degree Conferral ceremony on Sunday, April 26, at the Wyndham Grand Hotel in Downtown Pittsburgh. Overall, 273 students received graduate degrees this spring in one of the University's master's degree programs. Karen McIntyre, Ph.D., senior vice president for academic and student affairs and dean of faculty, gave opening remarks explaining the significance of the ceremony. "Today you receive academic hoods to identify you as masters in your fields - congratulations! The hood symbolizes your birth into a community of scholars and practitioners who make a difference in their roles," McIntyre said. Graduate hooding speaker and alumna Megs Yunn, founder of Beverly's Birthdays — a local nonprofit that provides birthday celebrations for children experiencing homelessness or families in need - gave the keynote address. Yunn encouraged the new graduates to look at new challenges in life through the lens of an infant who has just discovered his or her hands, realizing that the world is at their fingertips. "You've worked so hard to earn your graduate degree and are equipped with a whole new set of resources to take on your careers. Remember to look at life as if you've just discovered your own hands, the world is literally at your fingertips and is filled with opportunities and possibilities - you just have to reach out and grab them." Student speaker Deema Abdallah, from Lebanon, described Point Park as her home away from home during her graduate experience as an M.B.A. student. "Point Park University celebrates diversity. I met friends from China, Montenegro, Turkey and Egypt who have become like family," said Abdallah. "Point Park's diverse environment, rich graduate programs and supportive faculty have played an important role in preparing all of us for our futures." New graduate Frank Sottile, who earned an M.A. in journalism and mass communication, shared his thoughts about the significance of attending Point Park's hooding ceremony. "The hooding ceremony was an incredible experience. It reinforced the importance of all of the hard work that I and my fellow graduates put into our studies, as well as provided inspiration for the next steps in our lives and careers," said Sottile. "It was a wonderful opportunity to see the friends I've made and reconnect with faculty who have contributed so much to my academic success here." Following the ceremony, new graduates and their families attended a reception to celebrate their achievements.